Cambridge is less famous for its lush lawns than for its colleges and almost unknown is the one to be found in Girton behind the house of Sam Weller who, with his wife Mary, played host for this year’s Tynwald Day cooish held, for the first time in recent years, on 5th July itself. 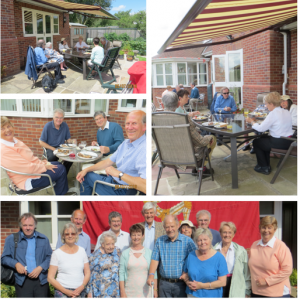 The society’s July event is always less well attended as holidays and competing events clash but an encouraging fourteen made the trip out of the big city to pass the afternoon on grass and patio to renew Manx acquaintances. The members who attended were Bryan and Sheila Corrin, Pam and Mike Fiddik, Colin and Sheila Gill, Sally and Peter Miller, Sam and Mary Weller, Douglas and Margarita Barr-Hamilton, David Hill and Maureen Wigley. There was no need to sing “Ellan Vannin” to get into expat mode for the food brought to the gathering included bonnag that Sam had made to his mother’s recipe and included in a recipe book of Andreas WI, which Mary Weller, a Bride resident, used to attend. Also, there was a box of Davison’s ice cream that an enterprising Douglas Barr-Hamilton had packed with a freezer block in a cool bag placed in his hold baggage at the end of a recent visit to the Island, thanking Iceland in Ramsey for their help in the endeavour. Finally, Moore’s kippers with particular thanks to Paul Desmond who had made special arrangements to ensure that Peel’s perfect product arrived in the best possible state of freshness. All this with savouries, desserts, cheeses and drinks provided by all attending ensured a feast with much for everyone to enjoy. Then it was chat in small groups for the conversational, play Giant Connect 4 for the mathematical and explore the garden for the horticultural. Everyone did a bit of each; all gave a few moments to sign a card to wish the Ramsey lifeboat a happy birthday on its 25th anniversary and a few more to admire some Island pictures. Many hours later, “So long!” and “See you at the Mhelliah!” and a group photograph. We are sorry to be so very late in advising members of Barbara’s death on 25th April last year; it was only the return of June’s newsletter by the care home in Whitchurch, Hampshire where she had lived for several years that gave us the sad news. Rose Fowler wrote “Barbara Reid – as she was then – went to Douglas High School and was in the same class as my sister so I should think she was born 1928. I don’t know where Bobby and his wife live now. Bobby was a surveyor the same time I was and I believe he worked with Transport in London on maintaining their buildings”. The Society extends its sympathy to all friends and family. The Society is delighted to report that the Island’s new governor, Sir Richard Gozney, has advised us that he will be delighted to continue the tradition of governor as one of London Manx’s three patrons. Installed only on 27th May, he wanted to give prior consideration to each position of patron he or his wife were expected to hold rather than a mechanical hand over from his predecessor. We therefore welcome the letter he wrote to us on 15th July. This year’s Mhelliah will be held on Monday 10th October, again in St Bride’s Church in Fleet Street. As usual it will begin at 12 noon with our service which will be led by Rev. Justin White who has kindly rewritten its liturgy in a better form without changing the style of the service. I understand the theme will be the renowned Bishop Wilson. Margaret Brady will again kindly play the organ. Afterwards, we will be returning to the nearby Punch Tavern at 99 Fleet Street, EC4Y 1DE where we enjoyed our meal two years ago and everyone is warmly invited. The committee asks that each person attending contributes £15, a reduction on last year, to cover expenses. It would be most helpful if everyone intending to come could advise Sam Weller (01223 720607) and full details are provided in the flyer accompanying this newsletter. Returning visitors to Ramsey’s Grove Museum in the former family home of the Gibb sisters, will find some changes, especially upstairs where two rooms have been altered to show some fresh themes. The former Toy Room becomes the Servant’s Room to show something of life as it would have been for a domestic help while the toys have been moved to the next room now named the Child’s Room which shows something of childhood both for the young sisters and for those from a poorer family. Modern technology has also been introduced and, amazingly, it actually takes the user back to a life over a hundred years ago. Seated on the newly installed Sound Bench, we can listen to a 1974 recording of Miss Janet Gibb talking about her childhood and of Ramsey as it was before the First World War. In so doing, it adds more depth to the visitors’ experience of the Grove. The house and gardens are open from 10.00 a.m. to 5.00 p.m. daily until Sunday 4th September and then closing at 4.00 p.m. daily until Sunday 30th October. Douglas Corporation’s decision to discontinue horse trams that we mentioned in our last issue has produced a number of reactions. One came from Bushey’s Brewery which, with the TT a short time away, came up with the “Tram Tastic” logo to feature on merchandise to promote its brand during the races. Just days before things got under way, brewery boss Martin Brunnschweiler said he hoped the ‘Tram Tastic’ design, would be on thousands of T-shirts, 100,000 stickers and 108,000 pint glasses to help raise awareness of their product. He had been amazed that, at a time when tourist attractions world-wide were trying to find new ways to promote themselves, the Island should be discussing getting rid of one. Let’s hope it proves one step in saving the trams that have been a feature of the promenade for very nearly 140 years. There were some new faces at this year’s World Bonnag Championships, held in St James’ Church in Dalby; namely compère Peter Quayle and judges Mona Kerruish and Jill Cain, who had the unenviable task of judging more than fifty bonnags. With barely room in the audience to swing a carton of buttermilk, talented bakers had the opportunity to test their skills on this simple, un-yeasted bread, which once caught the attention of the well known British cookery writer Elizabeth David. Whilst judging got under way, entertainment was provided by the Southern Belles (who sang a selection of songs from a number of decades) and later by vocalist Terry Qualtrough. Having tucked into a traditional Manx supper, members of the audience were invited to bid for one of the many competition bonnags. Cheques were presented to last year’s designated charities and introductions made by this year’s chosen charities – Craig’s Heartstrong Foundation and Excellent Development, a not-for-profit organisation supporting rural, dry land communities. Shoprite kindly sponsored the many classes on offer, which included a new category for those specialising in gluten free baking, and a class specifically for catering establishments, so as to encourage sales of a true Manx bonnag in the public arena. All those taking part in the competition received a complimentary bag of soda bread flour courtesy of Laxey Glen Flour Mill. Nearly fifty plays found in the Michael Players’ archive are to be released on line. The authors include P W Caine, Mona Douglas, Kathleen Faragher, J J Kneen, W B Meyrick, Juan Noa and Christopher Shimmin. Most are in their original manuscript form as written by the playwright, often with handwritten notes and corrections. They include some that were previously unheard of and others that were thought to be lost. The first batch comprising six short comic plays by J J Kneen is now available online. Sam Weller also has the scripts of dialect plays handed down from previous officers and intends to put them in the Society’s archives stored in the Manx Museum where there are already about half a dozen. As the Douglas Bay Horse Tramway reaches its one hundred and fortieth anniversary, debate still rages about its future, although many of the issues raised during recent discussion are reflected throughout its long history. Requiring an Act of Tynwald, the Douglas Bay Horse Tramway was created by entrepreneur Thomas Lightfoot in 1876, after he retired to Douglas. A Yorkshireman by birth, Lightfoot’s other notable achievements included the first Woodhead Railway Tunnel. Opened without ceremony on the 7 August, 1876, the new tramway adhered to certain regulations, including no less than six double journeys per weekday, a maximum fare of 3d and the use of animal power only. Investment in its development amounted to £7,000 – £8,000, but by late summer in its opening year the tramway was already carrying eight hundred to nine hundred passengers during a fourteen hour day. Unfortunately Lightfoot’s other ventures drained him financially, which forced him to sell the system to the Isle of Man Tramway Limited in 1882. New passing loops were added as the service continued to expand, a double track was laid five years later and passenger numbers continued to rise; dented briefly during a wet summer in 1889. Thomas Lightfoot died in 1893 aged seventy eight and was buried in Onchan churchyard, but the popularity of the Douglas Bay Horse Tramway continued unabated. Enhanced by the service provided by the Douglas and Laxey Coast Electric Tramway Company between Douglas and Groudle, passenger numbers increased to almost one million in that same year. Resold to the Douglas and Laxey Coast Electric Tramway Company the following year for £38,000, its popularity soared, reaching one million six hundred thousand passengers in just one year. The collapse of Dumbell’s Bank gave Douglas Corporation the opportunity of purchasing the Douglas Bay Horse Tramway (and the now defunct cable tramway) for £50,000 in 1901. By this time a double track had been put into place, a scheduled service ran in the winter and concern about wages prompted a one day strike. Rumours of closure persisted at various intervals and requests by the Manx Electric Railway to electrify the line (to offer passengers a complete journey between Ramsey and Victoria Pier) were rejected. Although simplified to a seasonal service in 1927, the Victorian transportation system attracted a record two and a half million passengers, but decades later a declining holiday trade took its toll. The fleet consisted of Winter Saloons, bulkhead Toastracks, Sunshades, Fully Open Toastracks and All Weather Cars (affectionately referred to as ‘tomato boxes’) and in celebration of the system’s eightieth anniversary all eighty tram horses paraded to the Victoria Pier. World events and impending social reform may yet provide a catalyst for the potential return of a sustainable tourism industry, initially developed by many Victorian entrepreneurs, but will this include the preservation of the Douglas Bay Horse Tramway? In our quiz a year ago we asked in which ship George Shuttleworth arrived on the Island for the 1935 TT. It was, of course, a fictitious character and a ficticious crossing in the (real) Mona’s Queen in the film, “No Limit”. However, when George Formby, the star of the film who played the role came to the Island for its showing in 1936, soon after its premier in mid December, he came by air. And he landed at Hall Caine Airport as he had at the end of May the previous year: its first “celebrity arrival”. It was a busy day with 78 passengers most of whom had come to watch the Mannin Moar, a car race around the streets of Douglas which had been held in 1933 and 1934, but this was to be the last. George Formby had also come to prepare for “No Limit”. The airport was private, owned by the company Hall Caine Manx Airport Ltd whose proprietors were Ralph Hall Caine and Sir Derwent Hall Caine, sons on the novelist (Sir Thomas) Hall Caine and, after his death, named in his memory. It had a very short life. Opened soon after Hall Caine’s death in 1931, it was first known as Close Lake Airport having been built on land belonging to Close Lake Farm, north of Jurby Road, owned by the Hall Caine family. Modernised at a time when it was thought that its better weather record made it more suitable than Ronaldsway as the Island’s airport, its two 400 yard grass runways were extended to 800 yards and it was renamed in a ceremony on 30th April 1935. It closed in October 1937 as the development of larger planes made its runways unsuitable, Skyhill being thought a hazard and Douglas being rather too far away although it has to be said that Tynwald, debating airports in 1935, was opposed to any private airfield. The largest plane using Hall Caine Airport was the Armstrong-Whitworth Argosy, a triple engine bi-plane seating 28 passengers. At the start of the 1939-45 war, the airfield reopened as RAF Hall Caine and was used as an emergency landing strip until RAF Andreas was opened in 1941 when trenches were dug and obstacles placed across the field to prevent it being used by unauthorised aircraft, having been used for dropping the targets towed behind RAF aircraft, RAF Jurby being a gunnery training centre early in the war, transferring to Andreas in 1943. The Hall Caine company continued to file annual reports until 1965 and was only wound up in 1971, the year of Sir Derwent Hall Caine’s death. Sources: A M Goodwyn, Andreas (McCambridge and Dugdale), Manx Transport Review 1984. Hall Caine’s sons, Gordon Ralph Hall Caine (1884-1962) called Ralph in all the contemporary references I found but Gordon by Wikipedia, and his younger brother Derwent (1892-1971) were very different in character but seem to have worked hard together to improve the Island reputation of his father, famous throughout the world but, according to some local publications in his time, rather unpopular at home where he was perceived as arrogant and conceited. Finishing his education at King William’s College, at 18, Ralph was sent to America where his father had interests and studied business methods then, six years later with financial support from his father, he helped expand a tiny partnership to build Greycaine Ltd. in Watford, an early pioneer of mass produced books but most famous for having printed the WW2 posters “Tell Nobody – Not even Her!” and “Keep Mum – She’s not so Dumb!” Gradually he added paper making to his interests. Eight years younger, Derwent was an asthmatic child sent to be educated in Eastbourne at an establishment where his health problems could be accommodated. He became an actor and made his debut on the stage at the age of 14. In 1915 he landed a part in a British film version of “The Christian,” one of his father’s novels, having escaped conscription into the First World War because of his health, a frailty that allowed him to go to America for the rest of the war to look after his father’s interests there – and to star in three films. The brothers held very different political views. Ralph was elected as an Independent Conservative MP in the 1922 General Election to represent East Dorset, a year later taking the Conservative whip. He lost the seat in the General Election of 1929, the same election that Derwent was the successful Labour candidate in Everton. Two year later, another General Election and Derwent lost his seat while Ralph regained his and continued his political career, holding the constituency until the 1945 General Election. Having been appointed Deputy Controller of Paper, *Ralph was awarded the CBE in 1920. With his higher profile, Derwent received a knighthood in 1935 and a baronetcy two years later although, with no legitimate heir, the title died with him. The brothers worked together on a number of projects including the publishing house, “The Readers Library” and, together, they built an airport. *Ralph Hall Caine proposed the Li’l Island toast at the LMS annual dinner at Anderton’s Hotel, Fleet Street, in October 1926. Other guests included Lady Raglan and Bishop Charles Thornton-Duesbury and the event was reported in the Daily Telegraph on 1st November. Photographs and presentation, Sam Weller. With the imminent handover of St Patrick’s Church, Jurby, to The Friends of Jurby Church, a recent exhibition at the venue highlighted the ecclesiastical building’s long and varied history. A prominent feature of the northern plain, the building is an important aspect of parish life, which is reflected in the work done by Sandra Kerrison for the publication Isle of Man History at Jurby Church. As well as raising funds for The Friends of Jurby Church, this well presented booklet provides an informative overview of both the building and the surrounding area; leading to a greater understanding of both the landscape and its people. The exhibition itself explored topics in more detail, with an opportunity to learn more about subjects such as local industry, Norse influence in the area, early Christianity, details of men from the parish who fought in both World Wars and the role of the church itself in the neighbourhood. The building will now be centred upon a new community based initiative, focusing on exhibitions, concerts, family history and realising its potential as a tourist attraction, but retaining an ecclesiastical link with occasional services, weddings and funerals. Manx National Heritage has added Peel Castle to its venues approved for weddings and civil ceremonies to those at Castle Rushen and Rushen Abbey and at its opening Peter Young, its Venue Hire Manager said, “The castle offers one of the finest wedding locations anywhere on the Island and offers a fairy-tale wedding venue for couples who dream of a romantic open-air castle wedding”. Our readers will know the castle and its surrounds well and will be interested to know that two areas of the castle grounds have been approved for open air weddings: the Garrison Hall and the Bowling Green. The hall which dates back to the 16th Century and was originally used by the garrison troops, is a few metres south of the Round Tower and takes up to 70 guests. The Bowling Green has been approved for up to 150 people. This flat outdoor area was once used for target practice, first by bowmen and later by musketeers. What happens when it rains? Up to 60 people seated can be accommodated in the St Patrick’s Isle Suite at the House of Manannan and others may have to remain in the House’s reception area where they will be dry and warm but receive a separate visit from the bride and groom. Not perfect as a venue for more than 100 if it’s wet then but idyllic if the sun shines. To find out more, request a brochure or visit www manxnationalheritage im/venue-hire. To make a booking, contact Peter Young at venuehire@mnh.gov.im. Wendy Kneen’s dad Bob was a passionate supporter of the shelter and served on its committee at a time of debate on knocking it down so she was delighted to read the following: It may appear a simple building compared with some in the Isle of Man, but the Peel Sailors’ Shelter has had an interesting history. Sited on Weatherglass Corner, where the promenade meets the harbour, it has always belonged to the people of the town. They paid for its construction with donations in the mid-1870s as a refuge for sailors from fishing and cargo vessels when stormy weather kept them shore-bound. Entries in the shelter’s first annual report for the year ending December 31, 1877, inform us that the idea for the building originated with the then High Bailiff of Peel, Robert John Moore, who held the office from 1853-84. A local builder, Mr Daniel Anderson, then undertook to construct the shelter – and he certainly did not delay. Records show that the first brick was laid on December 9, 1876, and the building was formally opened on January 12, 1877 – just 34 days later, and all for the princely sum of £172 17s 2½d. Although a fairly simple building it has always proudly sported the three legs of Mann emblem on its gable frontage – although facing the other way to the direction more usual today. The first annual report mentions that the first caretaker was a Mr Thomas Killey, himself an old seaman, who ‘is always at his post, keeps the room in thorough good order and scrupulously clean, and is civil and attentive to all’. To use the shelter, sailors were required to pay a membership fee of one shilling a quarter – payable in advance – and in return they could avail themselves of a roof over their heads with free lighting and heating provided, and where they could pass their time in port in the company of like-minded souls or perhaps read the local papers placed there. Part of the reason for providing them with the shelter was a temperance movement-inspired motive of keeping sailors out of the town’s pubs and so avoiding problems associated with drunkenness. The hope was that in the Sailors’ Shelter they could talk, debate or enjoy a game of cards or draughts without there being any rowdiness. ‘THE ART CLASS will be resumed at the Seaman’s Shelter, Peel, on Thursday, October 20, at 7 o’clock. The Subjects taught will consist of Freehand, model, Perspective, Geometry, Shading from models and the Cast, Painting in Water Colours and in Oils, Architecture, Building, Construction, &c. The Class will meet from 7 to 8-30pm, on the evenings of Thursday and Saturday. Any further information may be obtained from the Secretary, or the master, Mr D M Robertson, School of Art, Douglas. ‘On Friday night week, Mr Hall Caine, the celebrated novelist, author of “The Bondman”, “Son of Hagar”, “The Deemster” &c entertained at supper a number of old people of Peel and district, the qualification being that the guests should be at least sixty years of age. About seventy sat down in the Fisherman’s (sic) Shelter. Mr Lucas was the caterer and provided an excellent menu, to which ample justice was done. Mr W Cashin presided, and there assisted at the tables Messrs J Morrison, R Boyde, and J Quarrie. Mrs Hall Caine endeared herself to all by her good fellowship and geniality. ‘The tables having been cleared, a number of those present gave songs in Manx and English, and speeches. The only “outsider” present was the Rev T E Brown who helped to make the evening pleasant by his usual amusing stories. ‘Mr Hall Caine entertained nearly 100 old Manx people to dinner on Old Christmas Day at the Fishermen’s Refuge (sic) in Peel. It was an extraordinary gathering. Almost 20 were over eighty, and some over ninety. Nearly everyone present spoke Manx. By far the largest portion had never left the Island, except in the fishing boats and some had never set foot in a railway train. Only two or three had ever been in a theatre. Fortunately the shelter and nearby Harbour Master’s Building are still standing. The Sailors’ Shelter Committee has so far been able to secure an annual lease on the building and three years ago, aware of the Sailors’ Shelter’s history, Peel Heritage Trust paid for its front wall to be re-rendered and for its roof to be retiled and rebattoned. The Peel Commissioners also provided materials for the revamp. The shelter committee is now run by volunteers not as a charity but as a friendly society and people are welcome to use the building provided they make donations towards its upkeep and to cover the costs of heating and lighting. As a result it has become a real hit, used for events ranging from art exhibitions to dance classes and film shows. Committee member Bill Quine says it now regularly sees use four or five days a week and can also be hired as a venue for children’s parties or its facilities can provide a useful restroom or changing area for disabled groups visiting the town. In July and August last year it was an appropriate base for Peel’s Traditional Boat Weekend, and towards the end of the year Santa found it made a very comfortable grotto in which to receive children’s present requests. It hosted a family Christmas carol concert too. However, despite the renewed popularity of the building, Bill fears that a potential ‘sword of Damocles’ still hangs over the Peel Sailors’ Shelter because of the terms of its lease. Although owned by the people of Peel, the building stands on Isle of Man Government land. Part of the magic of the Isle of Man is its surviving structures from many different eras which help to bring its history to life. ‘They must not be allowed to be lost to sweeping modernisation and development through a lack of planning controls and regard for conservation. between north and south will be closed through Foxdale. Work is scheduled to start on 3rd October. The plan is to rebuild the 500 metre stretch through Foxdale between Dove Cottage and Costain’s Yard, a section which includes the Mines Road junction and the opportunity will be taken to lay a new storm drain down the centre of the road. As the road is narrow, there will have to be full road closure which will be organised in phases over three sections to maintain access for residents and businesses. Local bus services will be diverted but it is hoped that it will be possible to use the old railway route for a temporary relief road into the village from the north. Manx National Heritage is in the early stages of planning a new gallery at the Manx Museum, examining the role armed conflict has played in the history of the Island and the response of Manx people to it. The gallery will build upon the success of 2014’s temporary exhibition ‘This Terrible Ordeal’, which covered all aspects of the First World War, and aims to examine what armed service and conflict has meant for Manx people from the 1700s to the present day. In preparation for planning the new gallery, curators from Manx National Heritage would like to hear from people on the Isle of Man who have been affected by armed conflict in recent years. Eleanor Cobham was the second wife of Humphrey Duke of Gloucester who held a powerful position at that time. He was the youngest son of Henry IV and his first wife Mary de Bohun. He was the brother of Henry V and as uncle of Henry VI became Lord Protector to his young nephew on the death of his brother in 1422. In 1441 Eleanor was tried and convicted of practising witchcraft against the king in an attempt to retain power for her husband. In 1440, Roger Bolingbroke, one of the duke’s household and a noted astrologer and Thomas Southwell produced a horoscope for Eleanor which predicted the death of the king, which would have resulted in Gloucester becoming king and Eleanor his queen. On hearing this, the King’s Council charged the pair along with John Home, Eleanor’s personal confessor, with conspiring to kill the king with necromancy: communicating with the dead. Questioning named Eleanor as the instigator and suggested the involvement of Margery Jourdemayne, the Witch of Eye Next Westminster, whose help Eleanor is said to have sought in order to become pregnant. Found guilty, she was burned at the stake as a witch. Southwell died in the Tower of London and Bolingbroke was hanged, drawn and quartered. Eleanor was forced to undertake public penance and walk through the city of London without a hood and bearing a lighted taper. Life imprisonment in various remote locations followed. In July 1446 she was sent to Peel Castle where she remained until March 1449 when she was moved to Beaumaris Castle in Anglesey where she died on 7th July 1452. It is to Peel Castle though that it is said her restless spirit returns. A recent exhibition organised by members of Rushen Heritage Trust, focusing on the hey-day of tourism in the south of the Island, attracted a large number of visitors to Port Erin; many of whom reminisced about those halcyon days. The organisation’s volunteers had brought together a wealth of information and memories describing how visitors entertained themselves in Port Erin, Port St Mary and beyond and revolved around an extensive array of outdoor events, which afforded visitors a range of activities to keep them rooted in the south of the Island. These were simpler, less complicated times, when they were more inclined to relax in a deckchair on the beach, or challenge a member of the family to a leisurely game of ‘pitch and putt’. Paddling pools and Beach Missions kept the younger generation busy, whilst their elders may be more inclined towards a game of bowls, or a round of golf. Boating, fishing, bird watching (the feathered variety) and cycling were also great favourites, along with special excursions to the Calf of Man and exciting coach trips to other Island destinations. The once popular Traie Meanagh open-air baths, situated in what was advertised as one of the sunniest and most sheltered creeks in Port Erin Bay, attracted scores of spectators to watch talented divers perform at the sea water pool. Both Port Erin and Port St Mary are also remembered for their selection of hotels such as The Belle Vue and the Balqueen, amongst others, and a range of eateries to satisfy hungry visitors; the most well known probably the distinctive Collinson’s Cafe, now in private ownership. More work is still needed and what has been achieved was based on earlier research in the United States. The startling thing that they have discovered is that the exact DNA mutation causing the lack of tail: a deletion of just one letter from her 2.8 billion letter genome. It now wants to find which mutations are responsible for the differences between rumpies, stumpies and longies. Or could that be down to where the mother bit off its tail? The team is one of volunteer scientists and it aims to sequence the genomes of at least three Manx cats so as to find the DNA mutations that are specific to Manx cats. The cat whose DNA has been chosen has the appealing name of Bonnag. If you’d like to offer your Manx cat as one of the next spell of research (and pay for the sequence) or should you like to donate, you can do so on the team’s website, www.manxcatgenome.com). (a) one, (b) 11, (c) 12, (d) 16? (a) born there, (b) died there, (c) mother was Manx, (d) father was Manx? (a) 1824, (b) 1834, (c) 1844, (d) 1854? (a) St Adamnan, (b) St Bradan, (c) St Caiside, (d) St Drustan? (a) gold, (b) silver, (c) bronze, (d) none? Closing date, 16th October. The first reader to send me five correct answers will receive a £20 voucher towards dining at one of Harbour Lights’ island restaurants. 1 (c) The Summerland fire was in 1973. 2 (b) There was an 1836 proposal to merge Sodor and Man with Carlisle diocese. 3 (a) Cammag is an ancient Manx form of hockey. 4 (b) Hall-Caine had two sons, one a Conservative MP at Westminster, the other a Labour MP. 5 (c) A press gang provoked the Battle of Ballacraine. There was no all correct answer to our Summer quiz. After security concerns over the host of the LMS web site, we have changed to one called Godaddy. The user will notice little difference, the main one being it’s now much faster. Sean and Wendy report that Godaddy seem much easier to deal with and www.londonmanxsociety.co.uk is still the site to visit. Please accept the officers’ apologies for the blip in our on line service. The quality of on-line newsletters produced by our kindred Manx societies is improving apace and making us look rather old fashioned but, so far, all London Manx has attempted is the addition of the extra picture and the occasional late article to the reproduction on our web site of our paper publication. If members would like further change to our communication, do please let us know. Equally, let the editor know if you would prefer to receive your regular newsletter electronically. Robyn Bryant reports that the Auckland society’s 25th Jubilee went off very well indeed and the Society managed to increase its membership by a staggering twenty people. NAMA held its biennial conference in Annapolis from 23rd to 26th June and was most successful. The programme began with an informal dinner that developed into an impromptu musical evening. On Friday morning most opted for a trip on the river before joining the others for lunch after which all were free to explore the historic naval city. The evening, after a buffet dinner, was for the association’s General Meeting. A tour of the Naval Academy filled Saturday morning and ended with lunch there before a return to the hotel and four wonderful hours of Manx workshops. The President’s dinner and awards ceremony filled the evening and included a fascinating talk by Dr Ellen Lawler on Henry Callister, who emigrated to Maryland in the 18th century. There were Protestant and Catholic Church Sunday services in the Naval Academy chapel on Sunday morning before lingering farewells. The next conference was scheduled for 21st-24th June 2018 in Victoria, British Colombia. London Society members with friends or relations in Western Canada may like to combine a visit to them with the Convention. NAMA has a new web site: www.namanx.org. Well worth a visit. The Editor thanks Simon Artymiuk, Valerie Caine, Lynsey Clague, Bryan Corrin, Rose Fowler, Alastair Kneale, Wendy Kneen, Maisie Sell, Sam Weller,for their kind contribution and also Isle of Man Newspapers, Culture Vannin and Manx National Heritage. News about you and articles (of around 450 words) about Island life are welcome and of interest to all. If in doubt, please contact me. Contributions can be sent at any time for inclusion in the next newsletter, if possible by email (barrhamilton@btinternet.com) or to 132 Bush Hill, N21 2BS. Copyright is retained by the contributor. Opinions expressed are those of the contributor and not necessarily those of the editor or the Society. Closing date for the next issue, 25th November. A dozen golds, none quite the same. That every autumn brings anew. The Church Service, again at the Church of St Bride’s, Fleet Street, London, EC4Y 8AU will begin at 12 noon. It will be led by Reverend Justin White whom we met at the Lunch earlier this year and our own Margaret Brady will be organist. The social event will take place immediately after the service close by in The Punch Tavern, 99 Fleet Street, London, EC4Y 1DE. (The Press House Wine Bar has closed). All will finish not later than 4 p.m. The cost will be £15 per head, a reduction on last year, including lunch with a selection of dishes, tea and coffee – to be collected at the event (no need to send cheques in advance). We shall also have the traditional raffle, not a “bring and buy”. Please help our funds by supplying no more than one or two suitable items for the raffle and by purchasing generously! As usual, we will make sure there is plenty of time to chat to other members. We hope to see you at this special event. Naturally, it would be helpful to know in advance how many will be attending so it is essential that you please inform Sam Weller, our Treasurer on 01223 720607 or by e-mail at samandmary_weller@hotmail.com by Wednesday 5th October. Travel: The nearest stations are Blackfriars, St Paul’s (Central Line) and City (Thameslink) and numerous bus routes serve Fleet Street.